camera (Nati Harnik/AP Photo | Allison Shelley/Getty Images) Republican presidential candidate, real estate mogul Donald Trump in Ames, Iowa, July 18, 2015. | Sen. John McCain, R-AZ, in Washington on May 14, 2013. So far this election cycle, Donald Trump has called out Hispanics, China,and the Democrats, but his target Saturday at the Family Leadership Summit was former prisoner of war and fellow Republican Sen. John McCain. "He's a war hero because he was captured," Trump told moderator Frank Luntz, a remark that was followed by some boos from the nearly 2,000 attendees of the event on the campus of Iowa State University. 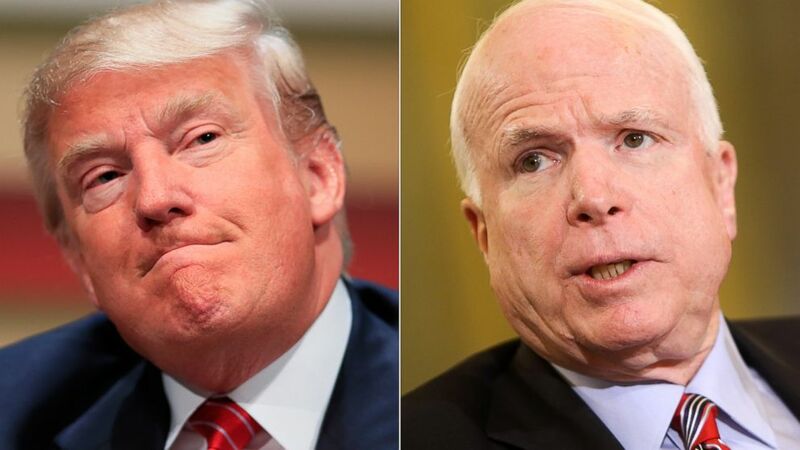 Calling McCain a "war hero," Luntz asked Trump why he would call the Senator from Arizona "a dummy" recently in response to Trump's campaign event in Arizona. McCain spent five and a half years as a prisoner of war during Vietnam. "I'm in Phoenix. I have a meeting (campaign event) that's going to have 500 people. ... We have 15,000 people. The biggest one ever. Bigger than Bernie Sanders," Trump said. Attempting to imitate McCain's voice, Trump says "Oh boy. Trump makes my life difficult. He had 15,000 crazies show up." Trump called his attendees beautiful, proud Americans and not crazy. But, he didn't stop at his war hero attack. "I like people who weren’t captured," Trump said, then told the audience that McCain "graduated last in his class at Annapolis (Naval Academy)." McCain spent five an a half years as a POW after he was captured in 1967 while flying his 23rd bombing mission over North Vietnam. His aircraft was shot down by a missile and he nearly drowned landing in a lake. He had his shoulder crushed by his captors, who refused to treat his injuries, which were exacerbated by beatings administered during interrogations. He survived a program of severe torture and his wartime injuries restrict him from lifting his arms above his head. The Republican Party also condemned his remarks, saying, "There is no place in our party or our country for comments that disparage those who have served honorably." Shortly after his remarks, Trump released a statement doubling down on his attack on McCain by saying, "I am not a fan John McCain because he has done so little for our Veterans." John McCain was not available for comment.